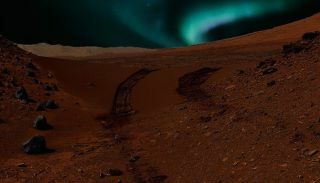 This artist's conception shows auroras visible on Mars caused by magnetic anomalies. Even brighter Martian auroras may light the sky in regions with no magnetic field at all. The first astronauts to set foot on Mars may be in for a spectacular sight — the entire night sky filled with glowing auroras. Researchers working on NASA's Mars Atmosphere and Volatile Evolution (MAVEN) mission hosted a news conference this afternoon (Nov. 5) to discuss the orbiter's observations about the Red Planet's loss of atmosphere due to solar wind, and they also shared some details about MAVEN's measurements of Mars auroras. MAVEN detected these auroras using an instrument that observes ultraviolet light, which our eyes cannot detect. But modeling work suggests that the Martian phenomena may also be visible to the naked eye, Brain said. "If you're standing on the night side of Mars in a place where there's no light pollution, and looking up at the sky, you could see the whole sky light up at one of these events," Brain said. "It would be magnificent." Bright enough displays of this kind could possibly shine in green, red or blue light, aurora study lead author Nick Schneider, also of LASP, told Space.com via email. Earth's auroras are focused around the North and South Poles. The Earth's strong magnetic field deflects the charged particles streaming from the sun toward the planet's magnetic poles, creating a glowing, rippling light display. Mars, on the other hand, lacks a global magnetic field. That's bad news for protection against harsh radiation, but it means solar particles can make an impact across the entire sky. MAVEN has detected just a few large-scale aurora events since starting its science mission in November 2014. One event occurred in a 3- to 5-day stretch around Christmas in 2014 (which is why researchers termed the display the "Christmas Lights"), and another took place this past March. The orbiter has also detected very weak, quickly dissipating auroras caused by small-scale magnetic fluctuations on the planet, researchers said.